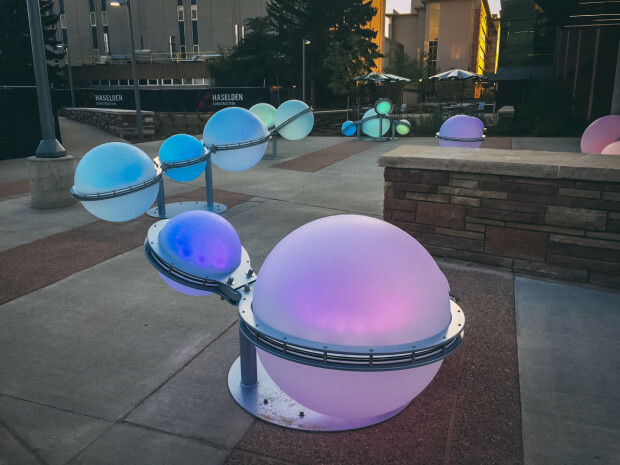 Earth’s Blanket consists of a series of six chemistry-themed sculptures that represent important molecules: water, carbon dioxide, methane, nitrous oxide, ozone, and freon-12. These molecules are the most abundant greenhouse gases. 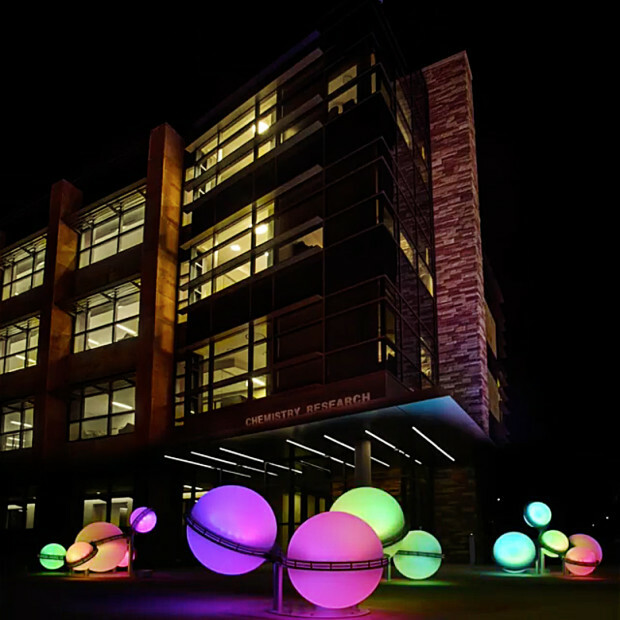 The molecular sculptures are installed in the Colorado State University Science Quad outside of the Chemistry Research Building. Each molecule is built with acrylic spheres of different sizes that represent individual atoms. Animated color sequences show the electrostatic charge distribution on the surface of each molecule - showing each molecule as it looks to other molecules. 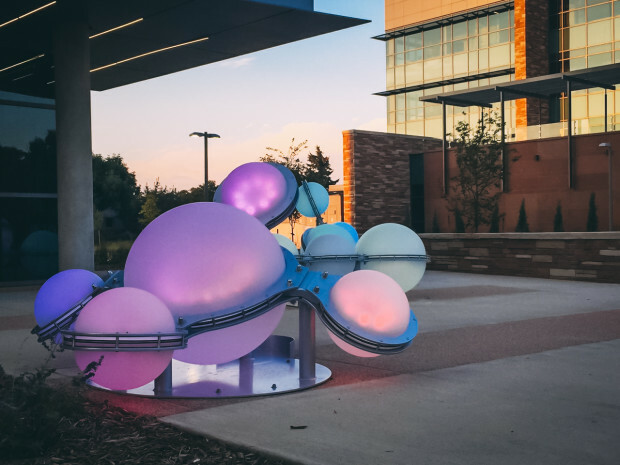 The sculptures are arranged around the Chemistry Research Building in an array that invites exploration and socializing. Imagine sitting on a hydrogen atom and leaning back on oxygen while you study! During the day, the acrylic spheres that make up the molecules will pick up sunlight and glow softly. At night, vibrantly colored lights will illuminate the spheres from the interior creating a spectacular sight upon entering the space. 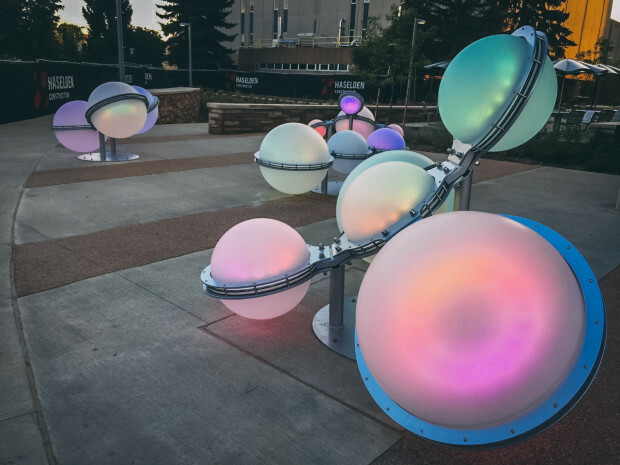 The sculpture is composed of a powder coated stainless steel and aluminum support structure, illuminated acrylic hemispheres and custom electronics. Spheres range from 5’L x 5’W x 3’H to 7’L x 8’W 4’H.